Abstract: Leadership, as a discipline, leadership education, as a field, and leadership educator, as a profession are still in their infancy and rapidly evolving. As professionals in higher education, we are constantly asked to provide opportunities for students to learn leadership, whether that is inside or outside of the classroom. However, very little, if any professional development occurs in how to create such learning opportunities. 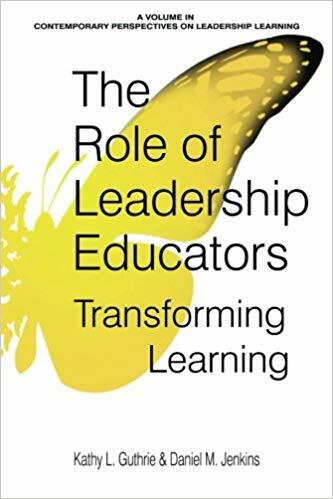 This book provides resources for leadership educators in three sections. The first section sets the stage for leadership education and the professional work of leadership educators, culminating with a variety of professional development resources for leadership educators. The second section introduces a leadership learning framework, provides characteristics and examples of strong leadership programs and assessment practices, and describes the transformative practice of leadership education. The third and final section offers specific instructional and assessment strategies ranging from discussion, case study, and reflection, to teambased and servicelearning to selfassessments, roleplay, simulation, and games, to fulfill learning outcomes.